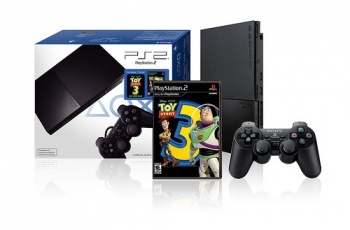 Sony still believes the PS2 has some solid sales potential and has just announced a new bundle for the console. Even though we're several incarnations into the PS3's existence, Sony wants you to know that it hasn't given up on the PlayStation 2's retail potential. The electronics manufacturer has revealed that it's putting out a new bundle of the ten-year-old console. The new special edition bundle will hit stores on October 31st, which comes with a PS2 build of Toy Story 3 and will run $99. It's actually a pretty decent price, especially if you happen to be looking for a DVD player with some gaming potential. It's tempting to write off the PS2 as a hopelessly-outdated system, but I have a number of friends who still get a lot of fun out of the console, especially when they're using it for party games or playing some of the more iconic titles like God of War and the Jak & Daxter series. For $99, the bundle is certainly a solid deal.